Members of the legal team filing civil suits on behalf of those injured in attacks by Golden Dawn have stated that the trial must begin as soon as possible. The lawyers representing the victims of violent attacks allegedly perpetrated by members of the Golden Dawn party have stressed the importance of the civil proceedings in the trial of the neo-Nazi group at a press conference. The leadership of Golden Dawn have been imprisoned pending their trial on charges related to operating a criminal organization. The violent attacks which were primarily directed at immigrants and members of minority communities are among the criminal activities prosecutors say were directed from the highest levels of the organization. The lawyers requested that the trial commence as soon as possible, noting that their contribution will be to reveal the truth around the attacks. They also issued a call for members of leftwing parties, workers unions and student organizations to be present at the trial so that the victims are not afraid to testify. The legal team stressed Golden Dawn had perpetrated significantly more attacks than were included in the casefile, stating that the neo-fascists had begun their campaign of violence before the time-period referred to by the state prosecutor Isidoros Dogiakos in his report. While the prosecutor’s report details numerous alleged crimes over 700 pages, the lawyers were critical of his handling of the case, arguing that he had been too lenient. They argue that the leadership of Golden Dawn should be tried on charges of operating a terrorist organization, as opposed to a criminal gang, under stricter anti-terrorism legislation. Javed Aslam, the head of ‘I Enotita’, a group representing Pakistani Community in Greece, claimed that among Pakistanis there were 700 victims of Golden Dawn attacks, which had also targeted the Bangladeshi and Arabic communities. He characterized Golden Dawn as a ‘terrorist party’ and stated that the government and the police were responsible for having turned a blind eye to Golden Dawn’s activities. 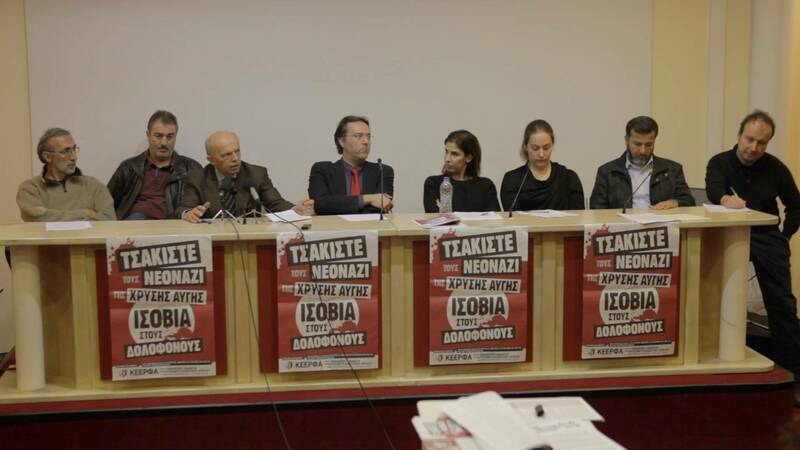 Read more: Financial appeal from the Initiative for the “Civil Action of the anti-fascist movement in the trial of Golden Dawn”. 26/11/2014 in International, Δίκη Χρυσής Αυγής.